It’s been one of those Stadium of the Year 2016 nominations that we had to look much closer into. After all, substantial completion of the building came as soon as September 2016, yet its official opening won’t take place until July 2017. But since it was complete and all sides opened to visitors on two occasions, Mosaic Stadium is therefore included in the Stadium of the Year 2016 list. This means we had to add it to StadiumDB and here is the story behind new Mosaic Stadium. 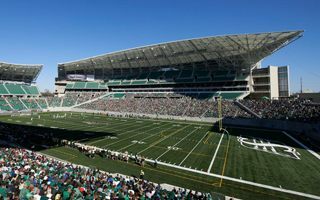 New football stadium for the Canadian city of Regina was first announced in 2012. It was even considered to have a retractable or permanent roof over the field but both options proved too expensive, leaving the city with more rational partial cover. The location just 430 meters west of old Mosaic Stadium was selected as part of a greater revitalization project. Thanks to this decision we could enjoy a view as wonderful as this below, one Mosaic Stadium visible from the other Mosaic Stadium. Yes, both have the same name after Mosaic signed a new 20-year naming rights deal in 2016, transferring the brand’s name from one stadium to the other.